The Women’s Legal History website is home to a searchable database of articles and papers on pioneering women lawyers in the United States. It also houses the indexes and bibliographic notes for the book, Woman Lawyer: The Trials of Clara Foltz , the story of the first woman admitted to the California bar, written by Barbara Babcock, the first woman appointed to the regular faculty at Stanford Law School. The site is maintained by the staff of Stanford’s Robert Crown Law Library in Babcock and her students. The site allows you to search for a specific lawyer or simply browse through the listings alphabetically. Listings vary in their detail, from skeletal to extensive. Most include at least basic facts about the lawyer’s career, such as where she went to law school, where she practiced, and the positions she held. Many include photographs and links to further research materials about the lawyer. The biographies can also be searched by ethnicity, law school, practice area, state, region or decade. I will confess that I found a mistake in the data when I searched my law school, Boston College, and read that a woman named Jessie Wright Whitcomb graduated from there in 1887. Given that BC Law was founded in 1929, something seemed amiss. From Whitcomb’s biography, I followed a link that brought me to a PDF of the 1890 issue of The Green Bag: A Useless But Entertaining Magazine for Lawyers. 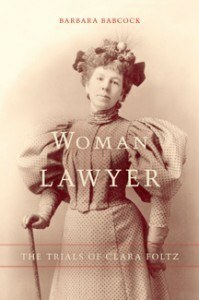 It included a lengthy article surveying the women lawyers of the United States written by Lelia J. Robinson, the first woman to graduate from Boston University Law School, in 1881, and the first woman admitted to the Massachusetts bar, in 1882. Her article revealed that Whitcomb was in fact a graduate of BU Law — the second woman to graduate from there.